Drosophila is a powerful model organism with rapidly evolving genetic tools. So much so that the technical advancements scientists made over the last several years enabled us to turn on and off a single gene or neuron at will and completely outpaced advancements in behavioral assays. Measurement of fly feeding behavior is one area that was overdue for improvement. So three scientists from University of Michigan went back to the drawing board, combined their complementary skills in machinery, electronics, and software development to design the dream apparatus that could solve most of the problems. This is what ultimately became the FLIC (Fly Liquid-food Interaction Counter)! 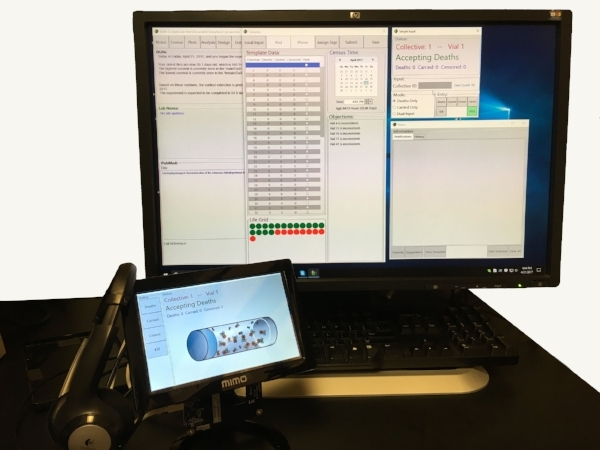 The FLIC system is a complete hardware and software package for collecting and quantifying continuous measures of feeding behaviors in Drosophila. As of 2016, the FLIC system has been commercialized with Sable Systems International Inc. For order information, contact Sable Systems. FLIC monitoring software and FLIC analysis R scripts are compatible across all FLIC systems and maintained by Flidea. Please visit here to download the software and learn how to set up the FLIC system. Do you want to modify the FLIC system for your own research need? Contact Flidea. Observing lifespan in large cohorts of age-matched individuals is how individual aging is manifest at the population level. Scientists are studying which genetic or environmental factors impact lifespan by conducting experiments with simple model organisms. Unfortunately manually recording who is dead or alive daily is laborious and not the best way to utilize skilled scientists' time. So Dr. Scott Pletcher, who has over 20 years of experience in aging research, came up with a set of tools to streamline and automate experimental setup, recording, and analysis of lifespan experiments. This became the basis for the dLife system. dFlat: A 12-well hotel for housing groups of flies. Using the hotel and slider system, you can transfer flies onto new foods in a matter of second and avoid taking time to individually flip conventional vials. Currently the dLife system is customized for the fruit fly research as a tracking system for life/death of flies or point-of-observation of certain morphological traits of flies. It consists of a touchscreen-based tracker and a software package. Interested in the dLife system? Contact sales@flidea.tech! We also developed dFlat, a 12-well housing unit, for high throughput assays where flies need to be aged. We are currently working with manufacturing and distribution partners for mass production.